The Bar top, front and rear serving shelves were made from solid Mahogany. The frontage of the bar and doors were clad with Quartz Riven Stone surrounded by a solid Mahogany framework. Mahogany Veneers were used for the divisions of the displays and the shell scheme of the cupboards. Three Displays with bronze mirrors and 10mm glass shelves were installed against the rear wall. Below the displays cupboards and shelves were provided. An Open cradle wine rack was created in the centre of the cupboard run. 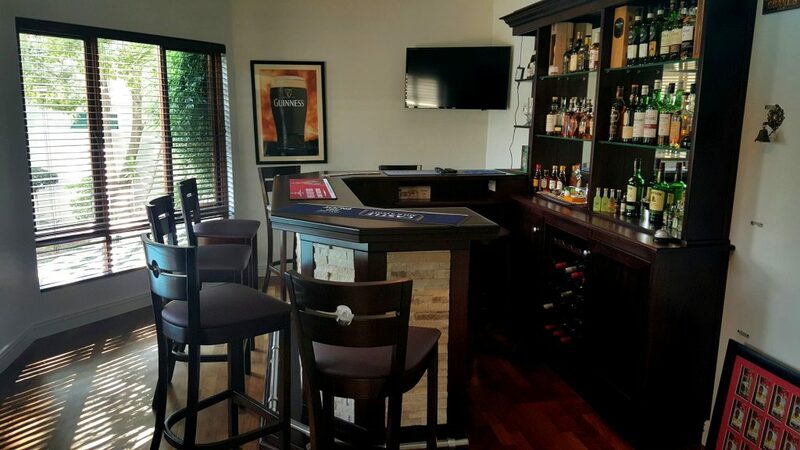 A timber boxed foot rest with a stainless steel rail was installed along the front of the bar. LED down lighters (steel finish) were supplied and installed in the display units.The overhang of the main counter had LED ribbon lighting to pick out the Quartz feature.